On the 15th of April 2014 in the village of Adzvi (Gori district), Russian occupation troops detained three employees of the ‘TV3' channel: Ms Bela Zakaidze, a reporter; Mr Vakhtang Lekiashvili, her cameraman; and Mr Mikheil Mikhoev, a broadcast technician. The crew worked on a report regarding the installation of barbed wires on the spot. The Georgian Foreign Ministry immediately notified the co-chairs of the Geneva international discussions, the EU Monitoring Mission in Georgia and other international organizations of the detention of the Georgian journalists, and urges them to provide immediate support in order to ensure their release. 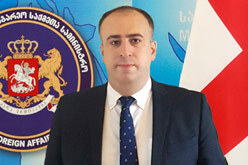 The Georgian Prime Minister's special envoy for relations with Russia, Mr Zurab Abashidze, also discussed the matter during his meeting in Prague with the Russian Deputy Foreign Minister, Mr Grigory Karasin, on the 16th of April. The Georgian Foreign Ministry is keeping the co-chairs of the Geneva international discussions and the EU Monitoring Mission in Georgia fully informed of developments. At the same time, the Georgian Foreign Ministry wishes to express its concern over a statement which the Russian Foreign Ministry made concerning the detention of the Georgian journalists on the 16th of April, which seems devoid of logic. The Georgian Foreign Ministry considers the Georgian journalists' illegal detention by Russian occupation troops to be yet another provocation, and the Georgian Government is not interested in escalating the situation, as its policies clearly illustrate. On the contrary, the Government's efforts are aimed at de-escalating relations with the Russian Federation on the basis of complete respect for Georgia's sovereignty and territorial integrity. The consistent steps it has taken so far are further proof of this. The Georgian Foreign Ministry strongly condemns the Georgian journalists' illegal detention during their work by Russian occupation troops, and calls for their immediate release. The Foreign Ministry also calls upon the international community, above all, as well as the European Union Monitoring Mission to consider Russia's illegal acts for what they are, and urges them to provide immediate support to efforts to ensure the journalists' immediate release.